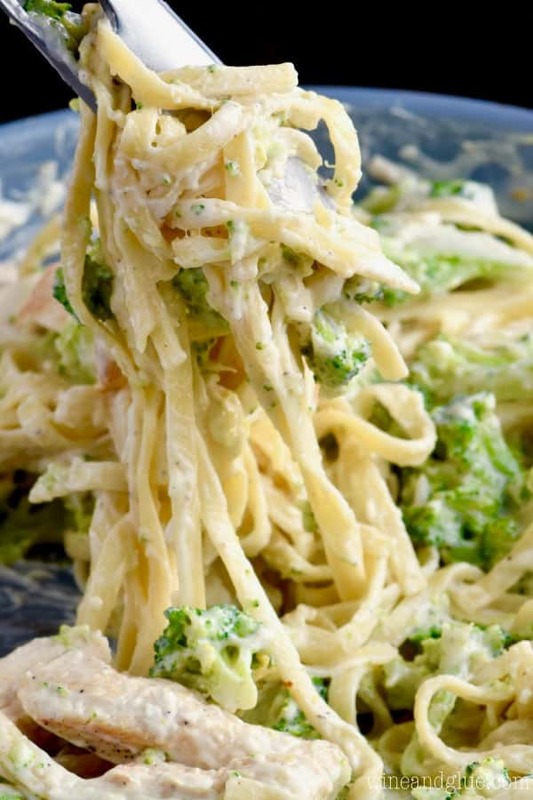 This Lighter Fettuccine Alfredo is a twist on the classic that is lower in calories, but completely satisfying and delicious! Sure to become a family staple. I am as happy as ever to be partnering with Horizon Organic to bring you this lighter version of a classic. We are Horizon lovers and serve their products to our happy little kiddos on a daily basis! Such an innocent and sweet little veggie and yet, it is met with such disdain from my littlest two. You guys. I am on like a crazy mission when it comes to broccoli. Where some parents would give up, I rage on in my stubbornness. Because here’s the deal. I love broccoli. Actually, I am pretty lucky in that there are very few veggies that I don’t like. And I attribute that to growing up in a a household that served them fresh and on the regular. Also, when your mom serves you a grain burger (please don’t ask) fresh roasted broccoli looks like dessert. For years, I have been serving my kids a staple in our house, pan fried Italian turkey sausages, noodles, and roasted broccoli. It’s a super easy meal that they love . . . . except for the addition of broccoli. But . . . . I am relentless in my pursuit, thinking back over and over to that advice that a child may have to try a food 10 times to like it. For the record, I haven’t kept track of how many times broccoli has been on the menu because I don’t even want to know. ???? 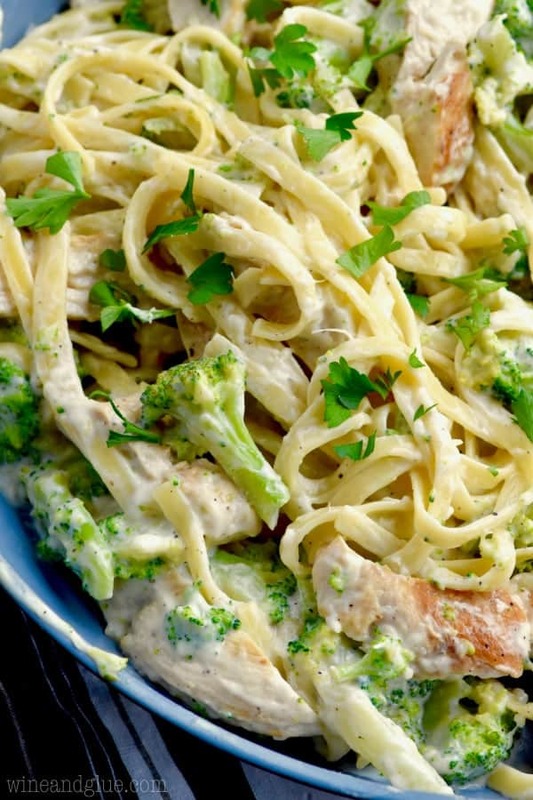 So, when I was thinking about this Lighter Fettuccine Alfredo, the first thing I thought of was BROCCOLI!! Yasssss, my precious. (Too weird? Moving on . . . . ). This lighter version is not low calorie. That pan pictured above breaks down to four very generous servings that come in at about 530 calories a bowl. Like I said, this is not for the person who is trying to drop 10 pounds and cram herself into a bikini before spring break (cough, not that I know anyone like that, cough). 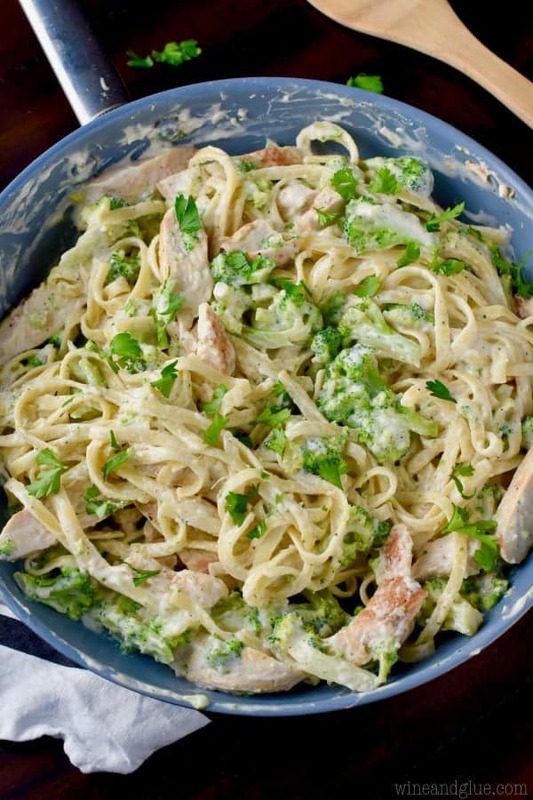 This is for someone who wants to enjoy Fettuccine Alfredo but doesn’t want to break the calorie bank. It is a significantly lighter option than a restaurant version that is going to come in at about double. You use half the noodles you normally would and fill in that space with delicious fresh broccoli that cooks right in there with your pasta. 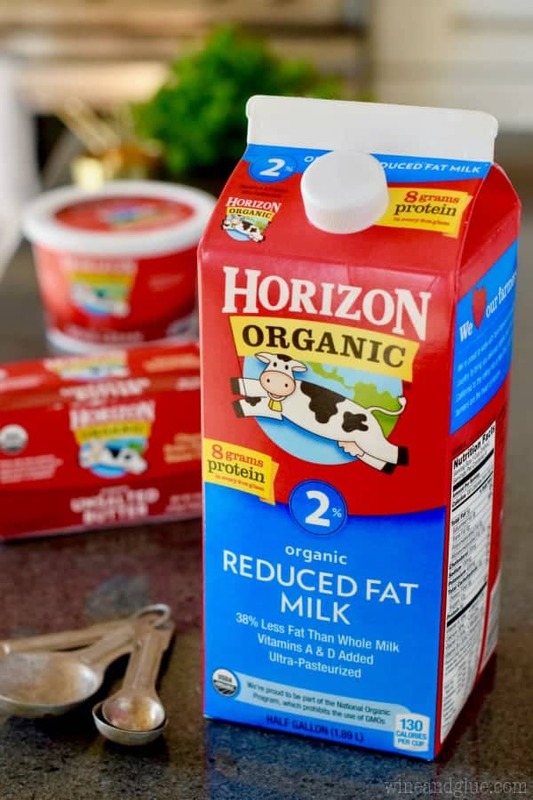 You also add some chicken for some great lean protein and you finish off your sauce using Horizon unsalted butter, their 2% milk (we always have a big carton on hand for Piper), and their light sour cream. Okay, I just heard you screech to a halt like a cartoon character. You guys, it is so unbelievably fantastic in this sauce. It doesn’t have an overwhelming sour cream taste in the sauce. But it does add creaminess without the added calories that heavy cream brings. The Horizon Light Sour Cream is fantastic in this dish, you must try it. You will be happy to know that my kids gobbled this up. Even the broccoli! The always are skeptical about cream sauces, but they loved this one. This is definitely going to be a repeat dinner in our house. So delicious and very easy to throw together too! The whole dish comes together in about 30 minutes! For more delicious dinner ideas, be sure to follow Horizon on Facebook, Instagram, Twitter, and Pinterest! Place a large pot of water to over high heat and bring to a boil. Add fettuccine noodles and cook as directed on the box. With six minutes left of cook time, add the broccoli florets to the boiling water. At the end of the noodle cooking time, drain both together and set aside. While the water is coming to a boil, place a large pan over medium heat. Spray the pan with cooking oil. Season the chicken on both sides with salt and pepper. Cook in the pan, about five minutes on each side until it is cooked through. Remove from the pan. Melt the butter in the pan. Add the garlic and cook for just 30 seconds being careful not to burn it. Add the flour and whisk with the butter. Very slowly add the milk, whisking as you go. Be sure to only add about a tablespoon at a time initially, making sure to fully integrate the milk before adding more. Finally stir in the parmesan cheese. Once it is fully melted, remove from the heat and mix in the sour cream. 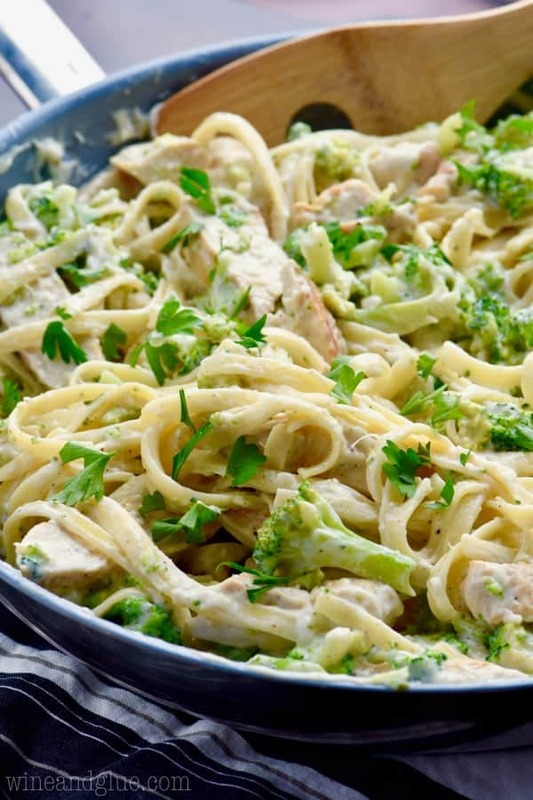 Return the chicken, noodles, and broccoli to the pan and mix so that all of the ingredients are completely covered by the sauce. Enjoy immediately! I am DEFINTIELY making this. I love alfredo so much and lighter is so much better! That looks sooooooo good! Thanks for sharing. 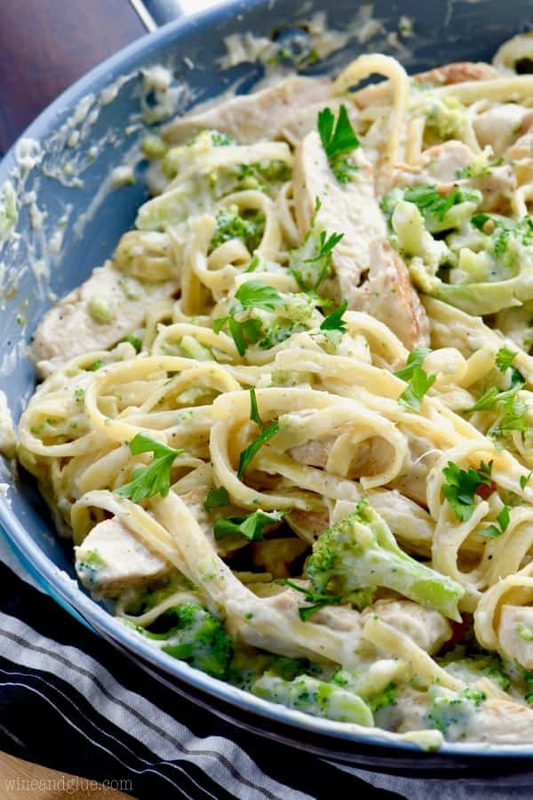 Alfredo that’s better for me? YES. SO down for this for dinner tonight! I am all over this and I love that you lightened it up! I also love that you added broccoli! I will be making this for my family for sure. Thanks Kelly!! I hope you guys love it! It’s definitely going back on the menu for us! Our kids ask for “creamy noodles” weekly. This is perfect!! Creamy Noodles ???? Your kids and I would get along just fine ???? LOVE this lightened up classic! I hope you guys like it Audra! That looks good I bet I can make it serve 8 though; cause we only eat about a cups worth of pasta. That way we can have garlic bread and fruit with it. Unfortunately, me and my daughter are trying to lose weight. I love the idea of broccoli in there.